Are you looking for a Lyme Regis removals company? Removals Lyme Regis; if you are looking to move to the Dorset, Hampshire or Wiltshire area, Maidmans Moving & Storage have been providing a removals, packing and storage service for over 30 years and are members of the British Association of Removers. Are you looking for estate agents in Lyme Regis? When moving to Lyme Regis you may wish to contact Estate Agents in Lyme Regis, to guide you through the renting or purchasing process. Most estate agents in Lyme Regis are not only situated in the high street but can be found online. The list below introduces some of the estate agents in Lyme Regis. The Lyme Regis postcode of DT7 has a wide range of types of property ages and styles. During July 2015 the average asking price for property in Lyme Regis was around £369,865, with detached houses around £482,765, semi-detached homes at £289,156 terraced property at £289,836 and flats at around £213,865. During May 2017 the average asking price for property in Lyme Regis changed to around £389,000, with detached houses around £503,000, semi-detached homes at £312,000 terraced property at £303,000 and flats at around £229,000. April 2018 saw the average asking price for property in Lyme Regis change to around £424,000, with detached houses around £549,000, semi-detached homes at £367,000 terraced property at £332,000 and flats at around £247,000. Source Zoopla. In December 2018 the average asking price for property in Lyme Regis is now £447,000, with detached houses around £587,000, semi-detached homes at £350,000 terraced property at £348,000 and flats at around £257,000. Source Zoopla. Should you be considering moving to Lyme Regis you will find Lyme Regis is a coastal town which lies in Lyme Bay, on the English Channel in the county of Dorset. The map below shows the location of Lyme Regis. 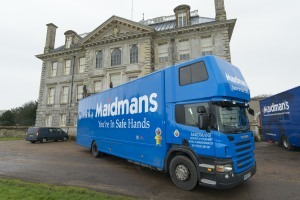 This removals Lyme Regis location guide is brought to you by www.maidmans.com the removals and storage company serving Dorset, Hampshire,Wiltshire and the surrounding area. This service is aimed at people moving in the area and for those looking for a local removals, storage and shipping company.